Magic happens when two bookend generations come together to play games and socialize. This is exactly what happened when Erin Duwe, mother and SimplyFun Playologist, took her kids and some SimplyFun games to her local assisted living facility. The decision to do this was personal for Erin because she has a special place in her heart for the elderly. One of her great joys growing up was talking and spending time with her grandparents and great-grandparents. Now that her grandfather is in the early stages of Alzheimer’s, Erin wants to be a support to him and others with memory loss. Erin’s support almost came as a full-time job as the activities coordinator at the facility, but ultimately the hours weren’t a good fit for her family life. Joining SimplyFun as a Playologist allowed her the time to be with her kids while also making an extra income. She also saw the opportunity to share the power of play, enrich her kids’ experiences with intergenerational connections and learn how the residents of the memory ward would interact with SimplyFun games. Play time at the facility was a success and Erin and her kids had a wonderful experience. She took several SimplyFun games to share. The favorites among all players were Dreaming Dragon and Digger’s Garden Match. Both games are easy to learn and play and interesting enough for all ages to enjoy. Erin observed that the level of difficulty was perfect for both the kids and the residents. She said her kids just wanted to play games and were non-judgmental when it came to playmates; “They’d just plop down next to a resident and roll the die.” The activities coordinator reported back to Erin that the residents were refreshed with the kids’ energy and really appreciated the change in “scenery”. With the success of this visit, Erin said she plans on making game play with her boys a monthly activity at the assisted living center. Oliver plays Dreaming Dragon with a new friend. 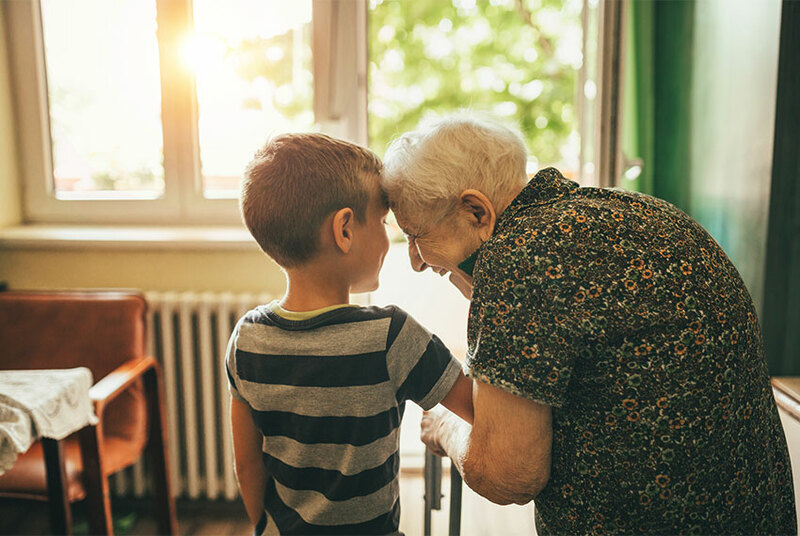 According to the Legacy Project on the Benefits of Intergenerational Connections, kids and the elderly share in the gift of not just doing but being. They have a different sense of time and less urgency to go, go, go, so intergenerational relationships benefit both groups. 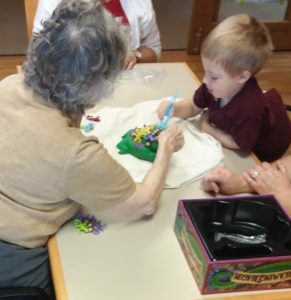 Game play is a great way to bring young and old together to challenge dexterity and memory and to just have FUN. Erin’s story is another example of how SimplyFun Playologists are able to take play beyond their homes and into their communities as part of their work as independent consultants. Not only have Playologists generously participated in SimplyFun’s annual campaign to Play It Forward, but the spirit of community involvement and giving back is prevalent throughout the year. If you’d like to share the benefits of play with your community and earn an income on your own terms, click here to learn more about becoming a SimplyFun Playologist.